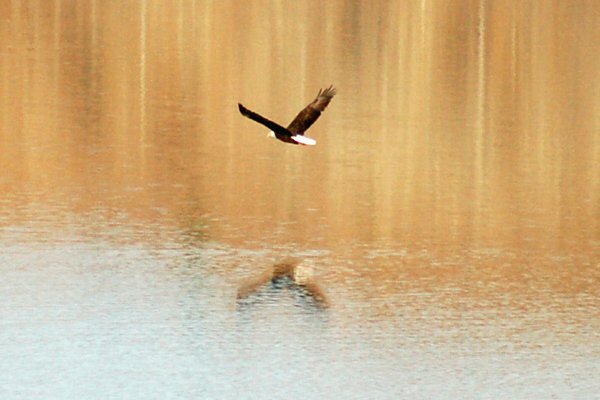 A bald eagle in flight skims across the surface of the lake in Black Mesa State Park near Kenton. The park is located in the panhandle at the junction of Oklahoma, Colorado and New Mexico. Black Mesa is the highest point in Oklahoma. As you approach the Black Mesa area of the Oklahoma panhandle, the wide open plains are suddenly interrupted by tall flat-topped mesas, deep canyons and steep slopes. At 4,793 feet above sea level, Black Mesa is the highest point in Oklahoma and marks the unique area where east meets west and the Rocky Mountains meet the shortgrass prairie of the Great Plains. Located along the tri-state border with Colorado and New Mexico, the steep slopes of Black Mesa attract species that are typical of the southern Rockies. Shortgrass prairie habitat dominates the areas surrounding the mesas and the more gentle slopes are covered in junipers and pinyon pines which attract woodland species. Many species are at the easternmost or westernmost portions of their range at Black Mesa, so visitors have an opportunity to view an amazing diversity of wildlife and birds here. Black Mesa attracts birders in all seasons with the opportunity to spot songbirds, jays and crows, upland and game birds, raptors, wading birds and shore birds. Species such as Mountain Bluebirds, Steller's Jays, Scrub Jays, Lesser Prairie Chickens and Burrowing Owls bring bird watchers flocking from east of the region to spot these birds that are rarely seen in their own areas. Black Mesa State Park is nestled in a sandstone canyon carved by the south fork tributary of Carrizo Creek. Plan a birding trip to Black Mesa State Park and camp among the rugged rock formations where you can picnic, hike, fish and enjoy abundant watchable wildlife. As you hike along the park's nature trail be on the lookout for elusive antelope as well as elk, mule deer, prairie dogs and, of course, a wonderful assortment of birds. Stroll along the banks of Carrizo Creek and you'll find a nice variety of riparian vegetation and birds. Carrizo Creek feeds into Lake Carl Etling where you can cast your line and reel in fish year round, or take advantage of excellent trout fishing during the winter months. Eagles spend their winter near the lake and do a little fishing of their own, offering fantastic photo ops. Also located within Black Mesa State Park are the petrified remains of an ancient forest. Walk among the petrified logs and tree stumps and imagine yourself surrounded by the colossal dinosaurs that were once plentiful in this area. You can find the fossilized footprints of an Allosaurus in a dry creek bed near the trailhead of Black Mesa Nature Preserve about 15 miles down the road from the state park. At Black Mesa Nature Preserve, visitors are invited to hike to the top of Black Mesa where they'll find a native granite monument marking the highest point in Oklahoma. Hikers who make it to the summit will find a container holding a journal that invites hikers to record their names, dates and thoughts about the experience. The hiking trail can be rigorous as it crosses steep terrain during the four-mile ascent to the summit and is approximately nine miles round trip. Allow about four hours to complete the hike to the high point monument and back to the trailhead parking area. If you plan to hike to the top of Black Mesa, be aware that the area is rugged and remote and unstaffed, so you should take appropriate safety precautions. Be sure that someone is aware of your location and your planned departure and return times. Consider avoiding the hottest part of the day during summer months and be sure to bring along plenty of drinking water whenever you hike. In addition to your birding field guide and binoculars, a compass and map of the area are good tools to have on hand as you hike. Download a Black Mesa Nature Preserve map to take along. Whether or not you choose to hike to the summit of Black Mesa, the bird watching in the area is extraordinary. Birders and naturalists have catalogued 72 species of songbirds, six species of jays and crows, six species of upland birds and game birds, 14 different raptor species and three types of wading or shore birds. The tables below show the seasons that you are most likely to spot each bird species at Black Mesa State Park and Nature Preserve. If you prefer not to camp in a tent or RV at Black Mesa State Park, there are three great lodging options in Kenton near Black Mesa. The Hitching Post Bed & Breakfast and Ranch, the Hoot Owl Ranch and Black Mesa Bed and Breakfast all offer comfortable accommodations and friendly hosts that are knowledgeable about the area. Make one of these your home away from home and you may decide to stay and explore the area for several enchanting days. At the Hitching Post Bed & Breakfast and Ranch you can stay in a log cabin, cottage, mobile home or in the ranch headquarters home. Ride the range with the owners on this working ranch or enjoy activities such as stagecoach rides, horseback riding by the hour, bird watching, hunting and tours of the area including a carved signature of the famous explorer, Coronado, who camped on the land in 1541. All lodging facilities include a kitchen or kitchenette. Hoot Owl Ranch offers two cozy cabins and a larger ranch house. When you stay at the Hoot Owl Ranch, your hosts, the Collins, can point you towards outstanding bird watching in Hoot Owl Canyon, or help you experience the incredibly rich history of the land, which includes dinosaur quarries and Anasazi carvings in sandstone cliffs. Stay at Black Mesa Bed and Breakfast to experience warm country hospitality on a working cattle ranch. Black Mesa Bed and Breakfast offers a double occupancy room, a second-story suite that sleeps eight and a two-room bunkhouse with bath house. Bird watching, rockhounding, astronomy, fishing and hunting are all available on-site and you'll also enjoy a delicious family-style country breakfast each morning.